My wife is the adventurous one. I’m kind of the home body. But, it was her birthday so after a delicious lunch at La Mar Cebicheria in San Francisco, when I mentioned that there were a few wineries out on Treasure Island I could see that gleam in her eye. Yes, I knew we’d be stuck in traffic on the way home and I had planned on having a glass of wine in the back yard but traffic be damned, I decided to give in to adventure. My son was of course on board because, hey, there’s got to be some treasure on Treasure Island right? The winery there that I’d heard of the most was La Vie because they make a Las Madres Syrah. Right away I was surprised by how much wine has become a part of what Treasure Island markets to tourists. As you come off the exit and down the hill you’re greeted with a huge sign from Winery SF painted onto a warehouse facade. The real surprise of the visit was Sol Rouge. I hadn’t heard of the winery but, after tasting the delicious wines at Vie, we took a chance and stopped next door at Sol Rouge. I say chance, because I hate tasting at wineries that aren’t any good. If they have Syrah, it’s always awkward when the pourers ask me what I think and I have to try to say something nice. Thankfully that wasn’t the case at Sol Rouge, not by a long shot. I took a bottle of Syrah home and enjoyed it immensely. 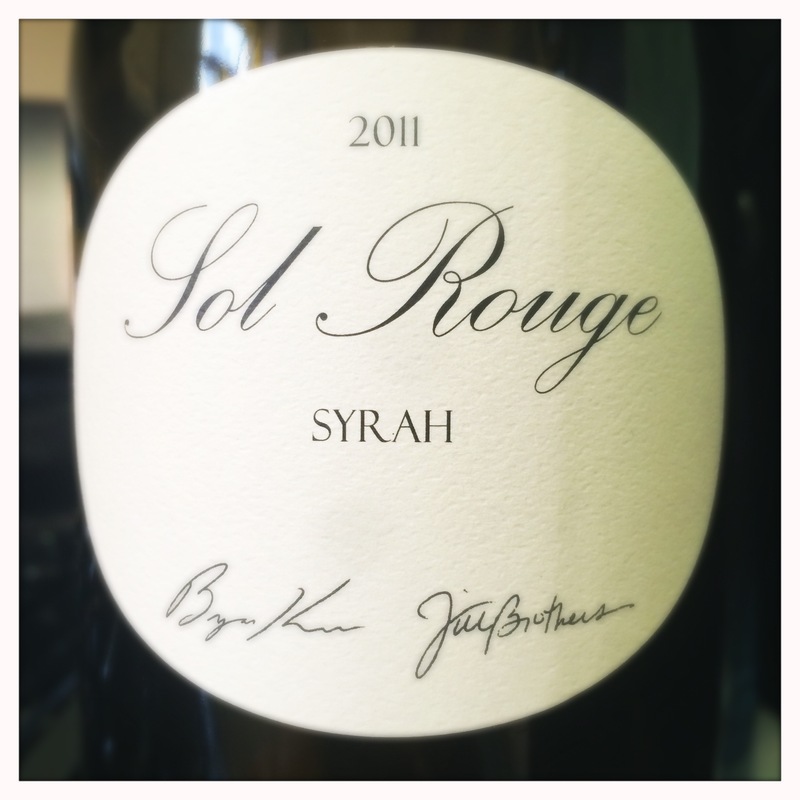 The 2011 Sol Rouge Syrah does have a little of that primary fruit California thing but it’s also really elegant and lithe on the palate. On the nose, there’s plum, aromas of mushroom and good minerality and energy with just a touch of oak. I get a bit of a savory, almost soy saucy aroma too. That savoriness carries over to the mid palate and makes for a delicious wine that keeps you salivating for another glass. Beautiful acidity to match and a not-too hot-finish. This is good stuff. I’m so glad I gave in to a little unplanned adventure and stopped by Treasure Island and Sol Rouge. Bryan Kane does the winemaking at Sol Rouge and this particular day his assistant winemaker Marc Ventre was pouring the wines. Bryan is the mastermind behind a lot of the Treasure Island Wineries, both Winery SF and Vie are his projects. The fruit from Sol Rouge comes from a steeply-sloped estate in the Red Hills appellation in Lake County that Bryan owns. It’s all planted with a high-density protocol that Bryan believes minimizes grape cluster production on each vine, therefore concentrating flavors. 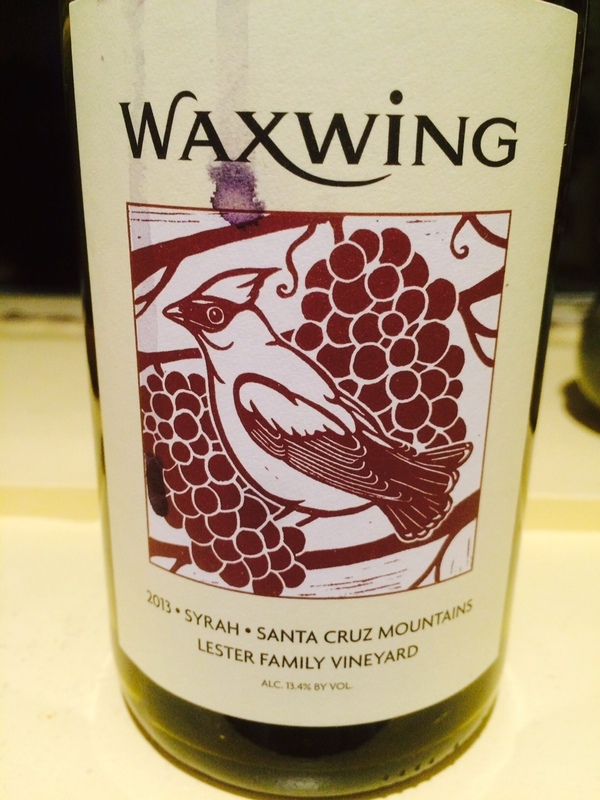 The 2011 Syrah was vinified in a hands-off style and aged in 20% new oak. I enjoyed the other wines I tasted at Sol Rouge also, they have a mostly Rhone focus which is right up my alley. They also sell wine by the glass and there’s even a bocce court. It’s definitely a place we’ll head back to if the weather ever warms up again here in the Bay Area. Early in April, on a gorgeous Sonoma, day I had the pleasure of attending a very special wine luncheon in the Carneros area of Sonoma. 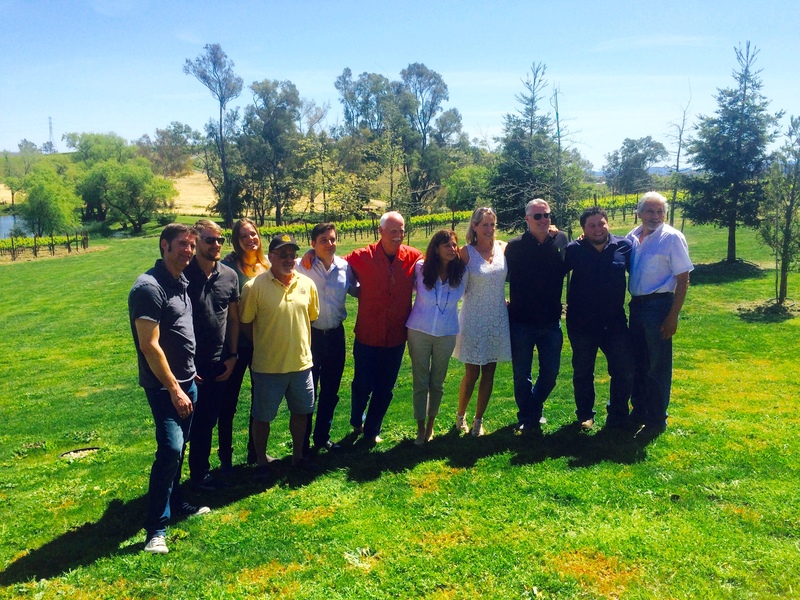 Every year vineyard owners John Painter and Jean Gadiot host a unique event at their Las Madres vineyard. I know the area well. My mother is manager of a ranch in Carneros, a ranch where I had worked for summers and weekends all through high school, college and even after college when I was between jobs. But it wasn’t until I actually plugged in the address to Google that I realized how close to the house this vineyard actually was. As the crow flies, the vineyard was probably only a couple of miles from the back end of the ranch’s property. I could have hopped the fence and walked over in about the same time it took me to drive. You can’t actually see the vineyard from the ranch so at least I have that excuse for not knowing that one of the Carneros most famous Syrah vineyards was basically in my own backyard. Las Madres is a small vineyard that consists of two separate block. One is planted with the 300 clone (also known as the Hulda block) and sits a little lower in elevation and a tad more protected from the afternoon wind. The other is the 174 (Esther) clone and is planted on a hillside making it a little more exposed. Some of the winemakers make wine from one of the specific blocks but most take a blend of the two. Interestingly, there are two picking dates for the vineyard. One late and one early. In 2014 the difference between these two dates was only about a week because of some impending rain that threatened the later pick. John believes that managing lots of different picking dates from different wineries is simply too much to handle so signing up for taking fruit at Las Madres means that you have to leave a little bit of individual control up to the collective power of the group. I first heard about Las Madres after I tasted a very impressive Syrah from Anaba Winery in Sonoma a few years back. The wine had a meaty, savory component that I completely fell in love with. Anaba unfortunately no longer takes fruit from Las Madres but the wine sure whet my appetite for more Las Madres Syrah. The annual luncheon that John and Jean host is unique because all of the winemakers are invited to talk about the wines they’ve made for the current vintage. We started the brunch off with a little meet and greet and an impressive rosé from Belharra wines. Made from a batch of Las Madres Syrah that was picked earlier than the Syrah for red wine, it was a mouthwatering introduction to the vineyard. Beautiful, light pink color with savory watermelon on the nose and very crisp mid-palate with a bright finish, it was everything I like about rosé. We got down to business with the twelve Syrahs on the table. Here they are in alphabetical order, they are all 2014 Syrahs. I’m not really reviewing the wines, as they haven’t actually been bottled yet, but rather giving a snapshot of how they are tasting at the moment. As I said, my general impression of all the wines was positive. This wine was the wine of the tasting for me (although, as I mentioned, I was impressed across the board), it had a floral element and more of a red fruit profile than some of the other wines and had a brightness and an elegance to it that I really enjoyed. I was surprised to learn later that the wine is around 15% ABV. Another example of how alcohol percentage is just a number, other elements must be giving the wine a sense of balance. This wine was made with very little intervention, 100% whole cluster made in one t-bin, this wine was meant as a little side project to see what whole cluster brings to the signature of the vineyard. At 12.8% alcohol, I was surprised at how much weight the wine had on the midpalate, A beautiful wine, with lots of litheness to it. The Campesino tended to the darker side of Syrah with some blackberry and black olive character. Good grip on the finish, a little more tannin. This wine had about 25% whole cluster. Eric Kent winery has been making wine from Las Madres since 2010. They’ve gone through a progression of using less and less new oak to let , as Kent put it, the signature of the vineyard shine through. This wine also seemed balanced despite a higher ABV of 14.4%. I have to say it was a tad closed down at the tasting but I did get some savory and meaty notes coming through, which I believe will develop over time. Guerilla is the home wine making project of ex-Gundlach Bundschu winemaker, Lance Cutler. He makes the wine basically for himself and some family members. This was a bit riper wine than some of the others but still possessing good Syrah character. The Jazz wine also tended to a riper profile with more of a milk-chocolatey thing going on in the nose. Mark Finver’s winery used 50% whole cluster, Esther block. 3-4% co-fermented with Viognier. 1/3 new oak. A very balanced Syrah with a lot of aromatic intensity, elegant and beautiful. I kept coming back to this one. Both the Myriad and the Quivet are separate brands from Mike Smith that he differentiates by making wines from the different Las Madres vineyard blocks. The Myriad is from a distinct block of the vineyard. A floral element was present on both these wines. This wine is made from the other block of the vineyard. A lower alcohol wine than many at 12.8% ABV this wine was also floral. Both wines had an energy to them that I responded to. Another elegant Las Madres Syrah, about 30% whole cluster. Vie is a winery on Treasure Island. The wine was made by Todd Seaver but presented to us at the tasting by winery partner Bryan Kane. This is a new project from a neighbor of John and Jean’s, Wanda Mae Lombardi. It’s made with more Viognier than the others, it’s a lighter style of Syrah that Wanda wanted to be more food-friendly. I think she succeeded. The last wine, poured after the tasting, due to the late arrival of the owner of the project, Jamie Watson, was also delicious. Made by Macario Montoya of Campesino in a completely hands off style, it was balanced and expressive on the nose. It was a pleasure to taste these wines and the fact that there wasn’t a stinker in the bunch not only speaks to the talent of the winemakers, but also the care that the vineyard owners and the vineyard manager, Armando Ceja, put into the vineyard. What was most interesting to me was that many of my preconceived notions of what I like (lower alcohol, whole cluster) were challenged. 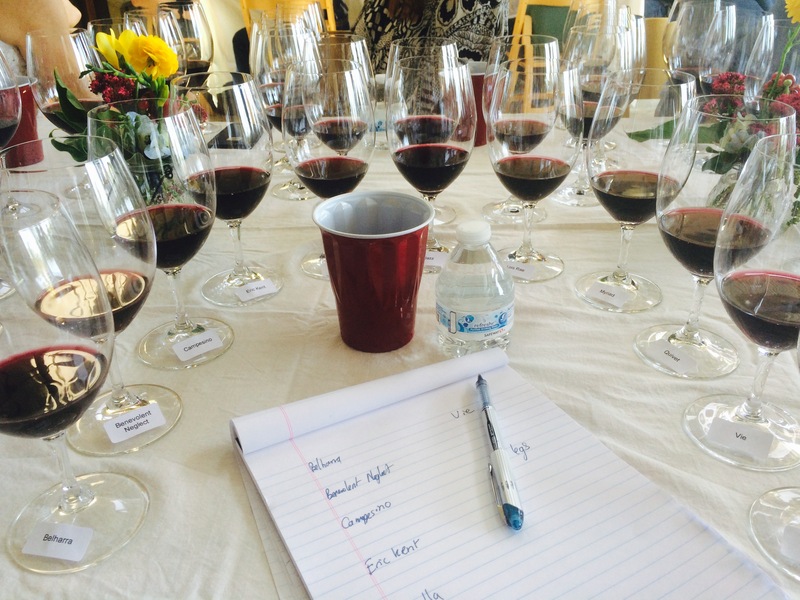 I found myself responding well to most of the wines regardless of their alcohol level and whether or not they had stem inclusion. And I guess that’s the takeaway from the tasting. Las Madres fruit can be made in different styles but in the end, the signature of a balanced, yet rich Syrah, with pure fruit expression and savory qualities almost always emerges.